People are busier and busier these days. We all pack a lot into our lives, reducing the time we have to take care of certain responsibilities. You can use this to your advantage if you need to make extra money on the side. If you have spare time and need a good side hustle, take advantage of the opportunity to run errands for money for busy people. Yes, it is possible to run errands and get paid cash. Thanks to the ridesharing industry and the growth of app-based services, you can use your free time help others in need and make money on the side. Many want to make extra money on the side but think they need a specialized skill. In certain circumstances you will need a certain skill to make extra cash. However, in many cases, all you need is the time and willingness to work. If you’re looking for a legit side hustle that lets you earn extra income in your spare time, here are nine ways to run errands for money. DoorDash is a service that allows you to pick up meals at a restaurant for other people. This is a service you can provide to help busy families who don’t want to spend the time picking up a meal. Driving for DoorDash, like other delivery services, gives you the flexibility to choose your own schedule. DoorDash also offers bonuses in certain cities so make sure to ask when you sign up. UberEats is a new service from Uber and is similar to DoorDash. Instead of being an Uber rideshare driver, you can now go get food for customers via UberEats. They have lots of restaurants participating in this, including McDonald’s. Driving for UberEats is a good side hustle option for single and busy moms because they don’t have to put strangers in their car with their kids and still run errands for money. UberEats and DoorDash also require the ability to lift up to 30 pounds. Delivering meals is one of the more popular ways to get paid for driving your car and, if you require a flexible schedule, is a great way to make money on the side. Lyft is a popular ridesharing service similar to Uber. Being a Lyft driver lets you make money running errands by helping people get to appointments or other locations. Lyft is available in cities across the country, and the great news is that you can set your own hours. There’s also a $250 sign-on bonus for new drivers. Driving for Lyft can be a great way to run errands for cash in your spare time. Check out our guide on how much money can you make driving for Lyft if you’re interested in driving for their service. Instacart is a really cool company that hires people to shop for groceries and deliver them to you. So if you don’t feel like going to the store to get a six pack of beer, all you need to do is open the Instacart app and order it. Of course, if you’d rather be on the other end and make money delivering the food, Instacart is a great option. You can make money running errands for elderly people who can’t or don’t want to leave their house or help the busy family unable to stop at the store. You never know who might need help. The woman who dropped off my groceries the first time I used it let me know that they rely on tips to make a good income on top of their weekly pay. So if you want to work with Instacart, remember that it’s OK to explain that to new customers. TaskRabbit has been around for quite a long time, so there are many people making extra money by completing tasks. I think what makes TaskRabbit unique is that you offer just about any errand or task on there. For example, if you happen to be really great at tiling a bathroom, you can put that skill on TaskRabbit and people can hire you to do that. If you want to mow someone’s lawn, go grocery shopping, or pick up a Starbucks latte for a new mom, you can do all of those through TaskRabbit. TaskRabbit pays out weekly and like many other ways to run errands for money, you can earn tips on top of your pay. Postmates isn’t available in all cities but it is expanding. Postmates hires people to deliver food, groceries, and drinks, and is a great way to run errands and get paid. So if someone wants donuts in the middle of the day, you can help them by going to get some for them. Postmates pays you 80 percent of the delivery fee and you get paid weekly. Like many other ways to make money running errands, you get to accept tips. Rover connects dog owners with dog walkers and dog sitters. Walking a dog is one of those errands or tasks that can be a drag, especially in the wintertime. If you want to make money walking dogs, sign up on the Rover app. If you decide to watch people’s dogs while they’re on vacation, you can set your own rates. I’ve seen sitters make as much as $50 per night. This can be good money, especially if you love spending time with animals. There are many companies that hire part-time couriers to run errands for money or deliver packages. If you’ve been to New York City, you’ve probably seen couriers carrying mail and packages on bikes. However, New York isn’t the only city that uses couriers. I used a courier one time when I left a pair of earrings in an Atlanta hotel. No matter how many times I called housekeeping, they assured me they had them and would mail them to me eventually. When I realized they might not do that at all, I hired a courier service. The courier went to the hotel, picked them up, and mailed them to me. It worked out well, and I was grateful for their help. If you’re interested in becoming a courier, do a search for companies in your area. They might be hiring part-time employees. Some of these services only operate in certain parts of the country or may not appeal to you. You can still run errands for money in many locations by keeping your eyes open for businesses that are hiring. Places like local grocery stores, drug stores, and home improvement stores have been known to hire people to make deliveries. Just keep an open eye for who is hiring or makes deliveries on a regular basis. Those can provide great opportunities to run errands and get paid. There are a number of things to keep in mind if you want to run errands for money. For instance, each service will have its own requirements. It’s important to know what they are before you sign up. If it’s an app based service like Lyft or DoorDash, you must be signed into the app to receive request notifications. This provides flexibility but make sure you put yourself in the best position possible to make money. Many services will view you as an independent contractor and not take out taxes. If you make over $400 for the year, you’ll be subject to self-employment tax. For example, if you drive for Lyft, it’s good practice to set aside a portion of your earnings each time you get paid so you can pay quarterly estimated taxes. Many of the services are heavily tip-based. Keep that in mind as you provide service to help increase your earnings. Running errands for cash is one of the simplest ways to make extra money on the side. It doesn’t require specialized skill. It primarily requires a reliable car, flexibility, and a willingness to work. If you have free time in your schedule and a need for extra cash, why not supplement your budget and make money running errands? Would you ever run errands for money to make extra cash? What are some other simple ways to make extra money you’ve considered? What are some important things to keep in mind if you make money running errands for elderly people? 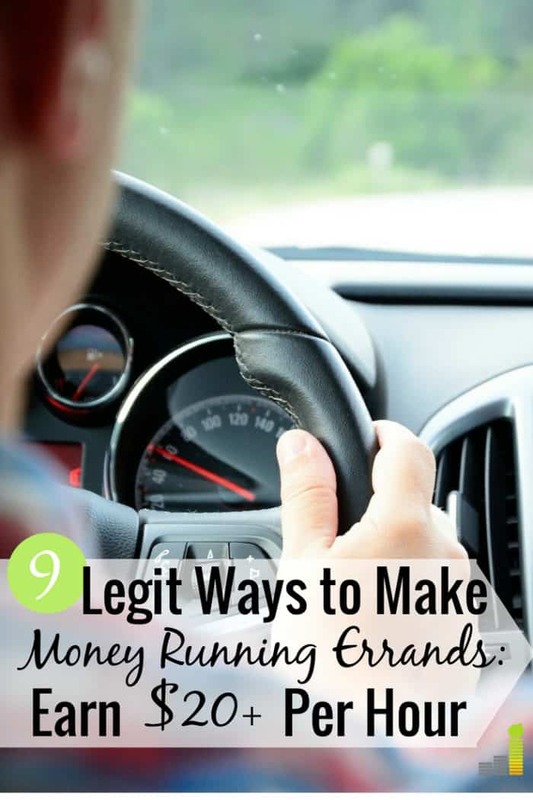 The post 9 Legit Ways to Run Errands for Money appeared first on Frugal Rules.